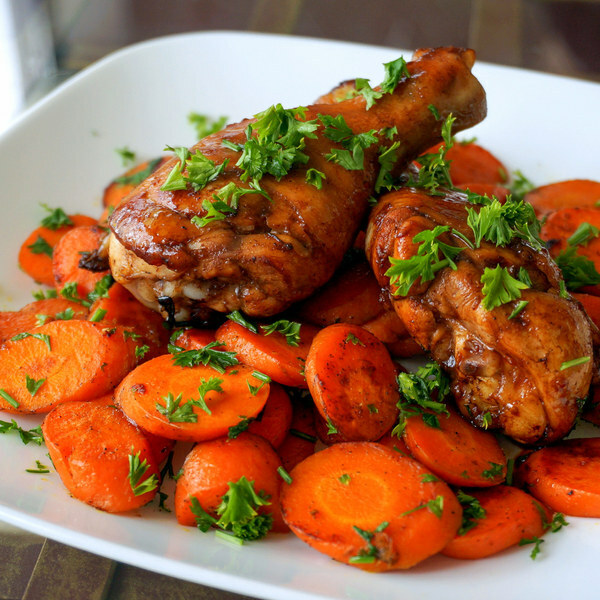 ← Balsamic Chicken Drumsticks with Garlic & Parsley Sautéed Carrots. Peel and mince garlic and ginger. In a large bowl, prepare marinade by whisking together ½ of the garlic and ginger (save the rest for the carrots), vinegar, honey, soy sauce, and pepper. Make a couple cuts in each of the drumsticks. Add to bowl with marinade and toss to coat. Transfer to a large baking dish, reserving marinade in bowl. Place in the oven and bake for 10 minutes. Spoon reserved marinade on top of chicken and continue baking until cooked through, another 10-15 minutes. Wash and peel carrots. Slice diagonally into ¼ in pieces. Coat bottom of skillet with oil. Add remaining garlic and ginger and cook until fragrant, 15-30 seconds. Add carrots and season with salt and pepper. Stirring frequently, cook until carrots are tender-crisp and slightly browned, 8-10 minutes. If skillet gets too dry, add a little water. Wash and dry parsley. Shave leaves off the stems; discard the stems and mince the leaves. Stir ½ (save the rest for garnishing) into the carrots. To serve, place carrots on a plate, add drumsticks on top, and garnish with remaining parsley. Enjoy!